Par. 1., Native American orientations to natural world, additional references: Indigenous religions specialist Robin Wright recommended also Lawrence Eugene Sullivan, Native Religions and Cultures of North America, Anthropology of the Sacred(New York: Continuum, 2000), and commented that Albanese’s list applies pretty well outside of North America. 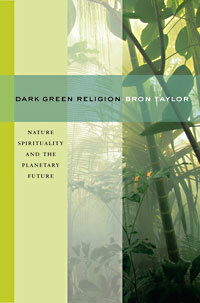 For more studies of Native American place-based spiritualities, which reveals affinities with dark green religion, see Kieth Basso,Wisdom Sits in Places: Landscape and Language among the Western Apache (Albuquerque: University of New Mexico Press, 1996), Howard L. Harrod, The Animals Came Dancing: Native American Sacred Ecology and Animal Kinship (Tucson, Arizona: University of Arizona Press, 2000), Joel Martin, The Land Looks after Us: A History of Native American Religion(New York: Oxford University Press, 2001), Richard K. Nelson, Make Prayers to the Raven: A Koyukon View of the Northern Forest (Chicago, Illinois: University of Chicago Press, 1983). For additional work focusing on indigenous cultures south of North America, see Lawrence Eugene Sullivan, Native Religions and Cultures of Central and South America (New York & London: Continuum International, 2002), Lawrence Eugene Sullivan and Alison Edwards, Stewards of the Sacred(Washington, DC: American Association of Museums & the Center for the Study of World Religions at Harvard University, 2004), and the discussion of ethnobiology and traditional ecological knowledge in Dark Green Religion, 153-54. Par. 2, on Organicism and James Hutton:In a preface to a later edition of his original book Lovelock noted that James Hutton, who is known as the father of geology, had an organicist insight as early as 1785. See James Lovelock, Gaia: A New Look at Life on Earth, Revised ed. (Oxford & New York: Oxford University Press, 1995 ), xviii-xix.. Par. 3, on Romanticism, additional references: For good introductions to Romanticism in Europe see Joan Steigerwald, "Romanticism in European History," and David Jasper, "Romanticism in European Literature," in Encyclopedia of Religion and Nature, and for full-length studies good starting points would Jonathon Bate, Romantic Ecology: Wordsworth and the Environmental Tradition (New York: Routledge, 1991) and M.H. Abrams, Natural Supernaturalism: Tradition and Revolution in Romantic Literature (New York: Norton, 1971). To speak truly, few adult persons can see nature. Most persons do not see the sun. At least they have a very superficial seeing. The sun illuminates only the eye of the man, but shines into the eye and the heart of the child. The lover of nature is he whose inward and outward senses are still truly adjusted to each other; who has retained the spirit of infancy even into the era of manhood. In the woods, too, a man casts off his years . . . In the woods, is perpetual youth. Within these plantations of God, a decorum and sanctity reign, a perennial festival is dressed, and the guest sees not how he should tire of them in a thousand years. In the woods, we return to reason and faith. There I feel that nothing can befall me in life,—no disgrace, no calamity (leaving me my eyes), which nature cannot repair. Standing on the bare ground,—my head bathed by the blithe air and uplifted into infinite space,—all mean egotism vanishes. I become a transparent eyeball; I am nothing; I see all; the currents of the Universal Being circulate through me; I am part or parcel of God. Par. 3, Emerson’s influence on nature religion and environmentalism:Historian of religion Albanese points out that Emerson’s influence was deep on the many streams of nature religion that championed nature’s healing capacities (including the New Thought movement in the late nineteenth century and the New Age movement in the late twentieth century); see Albanese, Nature Religion in America, 114-115. Par. 5, Darwin’s influence on Henry David Thoreau:Thoreau found Darwin’s theory of natural selection compelling, even defending it “to Emerson against [the Harvard biologist] Louis Agassiz's attacks” in 1860; see Henry David Thoreau, Henry David Thoreau: Collected Essays and Poems, ed. Elizabeth Hall Witherell (New York: Library of America/Penguin, 2001), 655. See also Bradley Dean’s “Chronology” in Henry David Thoreau, Faith in a Seed: The Dispersion of Seeds and Other Late Natural History Writings, ed. B. P. Dean (Washington, D.C. & Covelo, CA: Island Press, 1993), 214, as wsell as the excellent edition and its forward by Richard Dawkins, of Charles Darwin’s On the Origin of Species and the Voyage of the Beagle (New York: Knopf (Everyman's Library), 2003 [1859/1839]). Par. 3, on Thoreau’s attitude toward the senses:According to Albanese, Thoreau could not escape from "the Calvinist affirmations of his Puritan forebears", who quested for moral purity in the purification of the senses. See Albanese, Nature Religion in America, 89. In the text I am suggesting that Thorueau had a more complicated attitude. Par. 4., on the term Animism: See David Chidester, "Animism," in the Encyclopedia of Religion and Nature. Par. 1, Thoreau on Christianity and life after death: One biographer quoted Thoreau as saying that “a snowstorm was more to him than Christ.”See Walter Harding, The Days of Henry Thoreau: A Biography (New York: Knopf, 1965), 464, quoted in Rebecca Kneal Gould, "Thoreau, Henry David," in Encyclopedia of Religion and Nature, 1635. Approaching death, when asked about his view of the afterlife, Thoreau answered memorably, “One world at a time,” signaling an apparent agnosticism about such questions or at least impatience with them. This and other memorable, near-final words are recorded in Robert Richardson Jr.’s “Introduction” (pp. 3-17) in Henry David Thoreau, Faith in a Seed, 17. His very last words were recorded as “Moose” and “Indian,” in Thoreau, Essays and Poems, 656. Par. 3, Krutch’s perception of Thoreau animistic and pantheistic views:Buell also cited an influential anthology of nature writing that Krutch published in 1950 as further early evidence of Thoreau being promoted as an environmentalist prophet; see Joseph Wood Krutch, ed., Great American Nature Writing (New York: Sloane, 1950); Buell also cited a pantheistic essay by Krutch that argued Thoreau was promoting “a kind of pantheism.” See Joseph Wood Krutch, "A Kind of Pantheism,"Saturday Review, 10 June 1950; see also Buell, The Environmental Imagination, 542. Par. 3 (continuing p. 56), more on Oelschlaeger’s views about Thoreau:Throughout The Idea of Wilderness Oelschlaeger uses unconventional terminology, asserting that Thoreau "verges on recovery of the Paleolithic mind," shorthand for the consciousness of prehistoric hunter-foraging peoples; see 61. Paleolithic peoples, Oelschlaeger contended, had a “mythic consciousness” in which people “thought of themselves as one with plants and animals, rivers and forests, as part of a larger, encompassing whole” (11-12). Oelschlaeger speculated further that such peoples “believed that irrespective of place, nature was home; regarded nature as intrinsically feminine; thought of nature as alive; assumed that the entire world of plants and animals, even the land itself, was sacred; surmised that divinity could take many natural forms and that metaphor was the mode of divine access; believed that time ways synchronous, folded into and eternal mythical present; [and] supposed that ritual was essential to maintaining the natural and cyclical order of life and death” (12). The perceptions Oelschlaeger called “Paleolithic” are among the ones typically associated with Paganism and that I have in mind when I use this term. The term Paleolithic mind is a clever but not an apt term because, presumably, many people since pre-historic times, including many of those in indigenous societies, have had such perceptions. Oelschlaeger also obviously perceived that, what I am calling a spirituality of belonging to nature, was central for Thoreau; this can be seen in his comment that Thoreau’s genius was recognizing “the reality of organic process and the vital importance of understanding that humankind, too, is part of this larger, enframing realm—life within nature” (170). Both Roderick Nash and Edward Abbey contend that Thoreau left Transcendentalism for a more earthy spirituality some two decades before he died. Nash citied two passages written in the 1840s as evidence, see Nash, Wilderness and the American Mind, 85. Abbey offered a similar conclusion but without making a textual case, “Appearance is reality, Thoreau implies; or so it appears to me. I begin to think he outgrew transcendentalism rather early in his career, at about the same time that he was overcoming the influence of his onetime mentor Emerson.” See Edward Abbey, Down the River (New York: Dutton, 1982; reprint, Plume, 1991), 20. Chapter 4 explores Abbey’s own naturalistic spirituality, which helps to explain his affinity for Thoreau, as he understood him. Bernard Zaleha, a scholar who has studied avidly both Thoreau and Abbey, pointed me to the above-cited Abbey passage, and has been a valued conversation partner with regard to them. The popular environmental writer (and ethnobiologist) Gary Paul Nabhan, in his forward to a book with Thoreau’s most important post-Darwinian writings, concluded that Thoreau was “learning the language of fields and forests.” Thoreau, Faith in a Seed, xviii. This could be read as naturalistic animism, both Nabhan’s recognition of such sensitivities in Thoreau and his affinity for them. Par. 1 & 2, on how Thoreau if alive today:On this question I have the theorists of the social construction of reality in mind, such as Peter Berger and Thomas Luckmann, The Social Construction of Reality (Anchor: New York, 1966). They make clear how critical context and community are to inculcating and reinforcing human understandings. One reason Thoreau is considered a luminary is that he seemed to be expressing unique ideas uniquely. Scholars such as Buell, Environmental Imagination, however, have shown the many streams that contributed to Thoreau’s thought. But despite such influences he clearly was, if not an island, a unique individual. It makes sense to wonder how, if there were more social reinforcement for some of his more radical views (and here I am especially thinking about his religious views) would he have been even more forthright about them than he was? Specifically, would he have made more profound and clear a pagan or biocentric confession, as would occur in the next century, and if there was a non-supernaturalistic nature religion available as an intellectual and community option, is that where he would have gravitated? I think the answer is yes. The evidence for Thoreau’s importance as a spiritual elder is widespread and deserves in-depth treatment beyond what I could provide in Dark Green Religion. Such an analysis would consider his writings and the process by which they have become canonical within environmentalist and other circles (such as in the academic fields including literature and American Studies); examine how institutions have been established to carry forward the Thoreauvian charisma (such as through the invention of the Thoreau Society and eventually through a host of websites devoted to him), and examine the extent to which subsequent thinkers and movements have drawn on these writings. Par. 2, more on John Burroughs:Burroughs “never seems terribly worried about what he willingly admits are tensions and ‘contradictory points of view’ in his writing,” according to Gould, At Home in Nature, 129. Gould concludes that fairly late in his life he was still insisting that while “God is nature . . . there is some sort of omnipotent intelligence underlying the manifestations of power and orderliness that we see in the universe” (123-24). Elsewhere, Gould summarizes, “Burroughs’ views of nature were scientifically informed (he embraced the theories of Darwin), yet he feared that science would render nature absent of meaning and argued for a “Gospel of Nature” in which nature would be seen a vital, mysterious, beneficent force that could redeem humanity and set the terms for a virtuous life. At times, Burroughs argued that God and Nature were virtually equivalent, while in other, more Emersonian modes, he saw Nature as book to be read, with divine “lessons” lying behind nature’s physical surface. In either approach, however, he sought to divest God of any supernatural significance, while investing nature itself with a divine, moral and mystical sensibility.” See Rebecca Kneal Gould, "Back to the Land Movements," in Encyclopedia of Religion and Nature, 150. Par. 4, quote illustrating Burroughs difficulty accepting the animal origin of man: "The biologic tree has grown and developed as the geologic soil in which it is rooted has deepened and ripened. I am sure I was an evolutionist in the abstract, or by the quality and complexion of my mind, before I read Darwin, but to become an evolutionist in the concrete, and accept the doctrine of the animal origin of man, has not for me been an easy matter." Burroughs, Time and Change, v-vii. Par. 2., more on the Nearings influence:Gould explained that many who flocked to the Nearing’s homestead during the sixties and seventies “continued to live rurally and practice relative self-sufficiency through growing their own food and producing local crafts.” (At home in Nature, 151). The Nearing’s charismatic message and model was institutionalized by acolytes who established (or supported) “The Good Life Center,” a non-profit organization located at the Nearing’s Maine homestead. As a pilgrimage site and a center for publishing a variety of materials about a simple, spiritual, ecologically sensitive life, it proselytizes the Nearing’s inspirational model. The Center’s URL is http://www.goodlife.org/index.html. An online journal began publishing in 2005, and the articles in it provide a good feeling for the prevalence of spiritual themes prevalent within this bio-social milieu; see http://www.goodlife.org/glc_journal_cover.html. Par. 2, unabriged references on bioregionalism:For analysis of bioregionalism’s history and religious and political dimensions see Bron Taylor, "Bioregionalism: An Ethics of Loyalty to Place," Landscape Journal 19, no. 1&2 (2000), Bron Taylor, "Snyder, Gary -- and the Invention of Bioregional Spirituality and Politics," in Encyclopedia of Religion and Nature, ed. Bron Taylor (London & New York: Continuum International, 2005). The most important primary sources are Gary Snyder,Turtle Island (New York: New Directions, 1969); Brian Tokar, The Green Alternative: Creating an Ecological Future, second ed. (San Pedro, California: R.E. Miles, 1992), Ernest Friedrich Schumacher, Small is Beautiful: Economics as if People Mattered (New York: Harper and Row, 1973), Raymond Dasmann, "Toward a Dynamic Balance of Man and Nature," The Ecologist 6 (1976); Peter Berg and Raymond Dasmann, "Reinhabiting California," The Ecologist 7, no. December (1977); Peter Berg, ed., Reinhabiting a Separate Country: A Bioregional Anthology of Northern California (San Francisco: Planet Drum, 1978); Jim Dodge, "Living by Life: Some Bioregional Theory and Practice," CoEvolution Quarterly 32, winter (1981), James J. Parsons, "On 'Bioregionalism' and 'Watershed Consciousness'," Professional Geographer 37, no. 1 (1985); Van Andruss et al., eds., Home! : A Bioregional Reader (Philadelphia: New Society, 1990), Gary Snyder, The Practice of the Wild(San Francisco: North Point Press, 1990), Murray Bookchin, The Ecology of Freedom, revised ed. (Montreal/New York: Black Rose, 1991), Kirkpatrick Sale, Dwellers in the Land: The Bioregional Vision (Philadelphia, PA: New Society Publishers, 1991), Daniel Kemmis, Community and the Politics of Place (Norman, OK: University of Oklahoma Press, 1992), Stephanie Mills, In Service of the Wild: Restoring and Reinhabiting the Wild (Boston: Beacon, 1995), Wes Jackson, Becoming Native to This Place (Washington DC: Counterpoint, 1996), Freeman House, Totem Salmon: Life Lessons from Another Species (Boston: Beacon, 1999), David Landis Barnhill, At Home on Earth: Becoming Native to Our Place (Berkeley, California: University of California Press, 1999), Michael Vincent McGinnis, ed., Bioregionalism (New York and London: Routledge, 1999), Mitchell Thomashow, "Toward a Cosmopolitan Bioregionalism," in Bioregionalism, ed. McGinnis (London & New York: Routledge, 1999), Christopher McGrory Klyza, Wilderness Comes Home: Rewilding the Northeast (University Press of New England, 2001), Robert L. Thayer, Lifeplace: Bioregional Thought and Practice (Berkeley, CA: University of California Press, 2003). Par. 4, Muir on other organisms as persons:In Muir’s writings, references to "Nature's precious plant people" are relatively common, see e.g. John Muir, "My First Summer in the Sierra," in Muir: Nature Writings, ed. William Cronon (The Library of America, 1997 ), 231, cf. 283; elsewhere in this early work he spoke of “insect peoples” Muir, "First Summer," 224, whom he described in anthropomorphic terms as happy and carefree, speaking also of a grasshopper dancing “a fine sermon.” “Even the bear did not express for me the mountain’s wild health and strength and happiness so tellingly as did this comical little hopper,” in Muir, "First Summer," 232. Muir concluded this section by thanking the bear, deer, and grasshopper esp. for bringing “joy enlivening the massive sublimity of the mountains like the laugh of a child” (234). Given the negative way that most people view insects it is hard to imagine a stronger way to make a biocentric point. Par. 3, a similar quote to that in Cedar Keys found in “Wild Wool”: “I have never yet happened upon a trace of evidence that seemed to show that anyone animal was ever made for another as much as it was made for itself . . . it is made first for itself, then in more and more remotely we for all the world and worlds.” In Muir, "First Summer," 602-03. Par. 1, Muir’s words on stone sermons and mountain cathedrals: While speaking effusively about Yosemite’s Cathedral peak, e.g., Muir wrote, “It is a majestic temple of one stone, hewn from the living rock, and adorned with spires and pinnacles in regular cathedral style. The dwarf pines on the roof look like mosses. To move I hope some time to climb it to say my prayers and hear the Stone sermons.” Muir, "First Summer," 269, see also Muir’s thoughts on a holy place (180), sublime trees (183), and more on stone sermons, 238, 301. Nature’s love can be conveyed by animals even in high, cold places, for “Happily the ouzel and the old familiar robin are here to sing us welcome, and azure daisies beam with trustfulness and sympathy, enabling us to feel something of Nature’s love even here, beneath the gaze of her coldest rocks.” [Muir, "The Mountains of California," 367]. Such love can also be conveyed by entities most Westerners would consider inanimate, such as waterfalls, which Muir wrote, “lovingly” entice people to the experience they offer. [Muir, "The Mountains of California," 370.] For a sacramental baptism in Yosemite’s waterfalls, shortly after he arrived there 1869: “Last Sabbath I was baptized in the irised (sic) foam of the Vernal [waterfall] & in the divine snow of the Nevada [waterfall], and you were there also & stood in real presence by the sheet of joyous rapids beneath the bridge.” [See Holmes, The Young John Muir, 213]. Carolyn Merchant evaluated Muir’s alleged racism while surveying the critics and the passages such charges most rely upon. In a section analyzing his attitudes toward African Americans, she concluded, “Muir's account of his walk likewise reflected cultural prejudices against blacks” -- and she compared Muir unfavorably to Thoreau. See Carolyn Merchant, "Shades of Darkness: Race and Environmental History," Environmental History 8, no. 3 (2003), 386. About Thoreau she concluded: “Thoreau's concept of community not only included minorities, it encompassed both humanity and nature; he ‘regarded sunfish, plants, skunks, and even stars as fellows and neighbors-members, in other words, of his community’.” (384). But about Muir she wrote that when it came to oppressed minorities like Indians and African Americans, “Muir's environmental ethic included wilderness, but, unlike Thoreau, he was insensitive to much of humanity” (p. 387). One of Muir’s biographers, Steven Holmes, articulated a similar view about Muir’s apparent insensitivity to human suffering, “Muir’s wilderness ideals must be understood and critiqued as products of their cultural context at the same time as they may be valued as . . . an attempt to forge a larger and better vision of humanity in harmony with nature.” Steven J. Holmes, "Muir, John," in Encyclopedia of religion and nature, ed. Bron Taylor (London & New York: Continuum International, 2005), 1127. For his book-length treatment, see Holmes, The Young John Muir. Donald Worster has now provided the definitive Muir biography, which I read after Dark Green Religion was published, see Donald Worster, A Passion for Nature: the Life of John Muir (Oxford University Press, 2008). Among other things, Worster concludes that Muir was a pacifist, which rather than racism or insensitivity explains his refusal to participate in the Civil War. Worster notes the passages wherein Muir expresses discomfort and other feelings toward disadvantaged people and noted that he was not a social activist but Worster also shows his empathy them. Worster’s analysis is worth reading for it completeness and nuance. Merchant notes that other environmental writers before or contemporary to Muir had progressive attitudes toward ethic groups who were usually vilified and oppressed in U.S. culture. In addition to Muir, in this regard she mentioned Mary Austin, who in The Land of Little Rain (1903; reprint, Boston: Houghton Mifflin, 1950), expressed positive views about Indians while also advocating more just treatment of them. Merchant, "Shades of Darkness," 383. Austin was a contemporary of Muir’s whose writings, while far less well known, could easily be analyzed as an expression of dark green religion.